I often make meals where the main portion and the sides are cooked together, not just out of laziness or because I'm tired, rather the meat flavors infuse into the side, in this case a brown rice mixture. 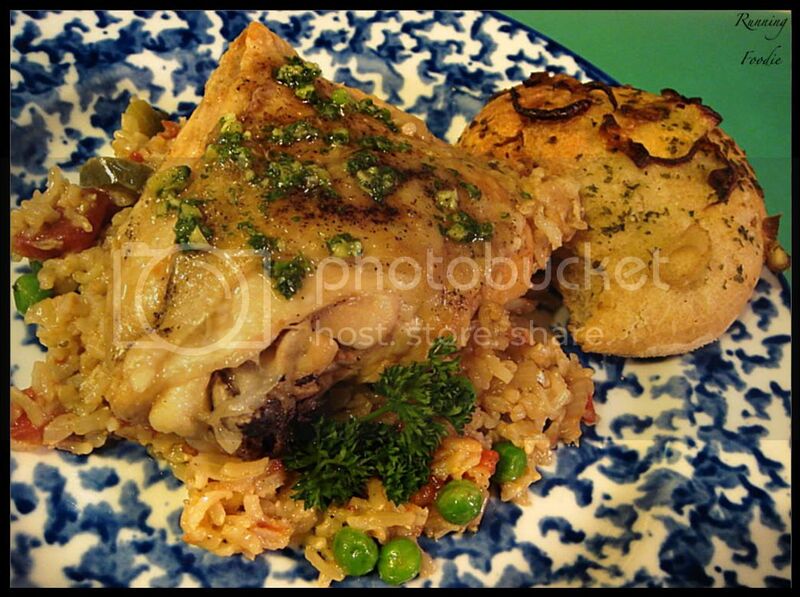 The recipe for Chicken with Brown Rice from Everyday Food seems rather plain, but the taste is not. With the addition of roasted red peppers (from a can), the flavor is a bit different than just with sautéed vegetables. Also, you get the benefits of whole grain because of the brown rice, so this meal is good all-around. The only exception is that you probably would want to make a vegetable side. It's easy to double the rice portion, and you can use less chicken pieces as well, and the prep for this recipe doesn't take long at all. Once you put it all together, you have an hour to do something else while it cooks. Because I wanted an accompaniment, I made Whole Wheat Onion Focaccia from my The Martha Stewart Living Cookbook ~ The Original Classics cookbook. Featuring puréed caramelized onions in the dough as well as parsley pesto (my idea) and whole caramelized onions on top, these were flavored nicely (I'm going to say it was, although I only had half the amount of onions) and the dough was soft, with an added crunch of cornmeal on the bottom. 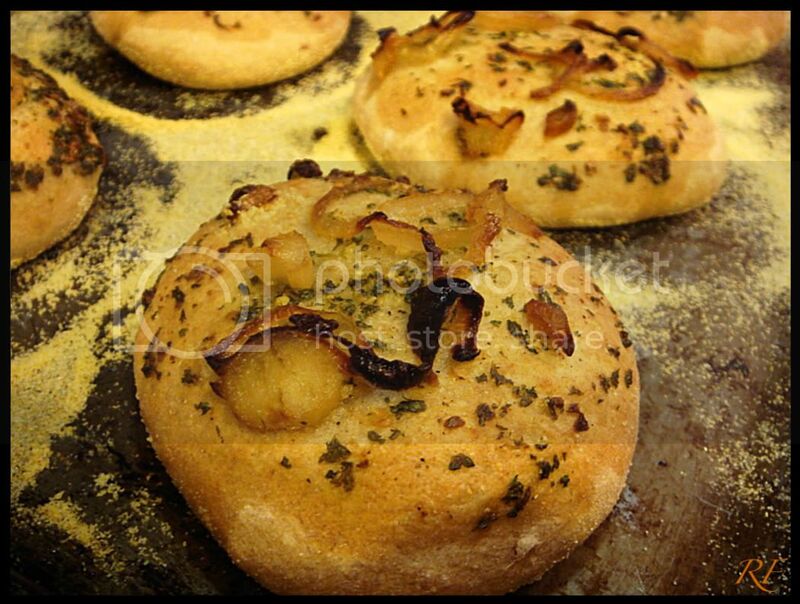 This really isn't a traditional focaccia dough so much as a 'whole-wheat and white flour dough discs with onions puree and focaccia toppings', but for a fairly quick recipe that tastes different than bread rolls, this is a good recipe to make. There's no fat in the dough, so these won't last a very long time. My only complaint is that I ended up using about 1 cup more of water than the recipe stated, though perhaps that was due to not having enough onion puree. Notes from the recipe: To save some time later, cover the brown rice with water in the morning, and let it soak all day; this will reduce the cooking time by about twenty minutes. Heat oil in a large straight-sided skillet over medium heat. Season chicken with 1 teaspoon salt and 1/4 teaspoon black pepper. Cook, turning, until golden on all sides, about 10 minutes; transfer to a plate. Add onion, garlic, 1 teaspoon salt, and 1/4 teaspoon pepper to skillet (Me: I added 1/2 teaspoon of tarragon for a double recipe of rice). 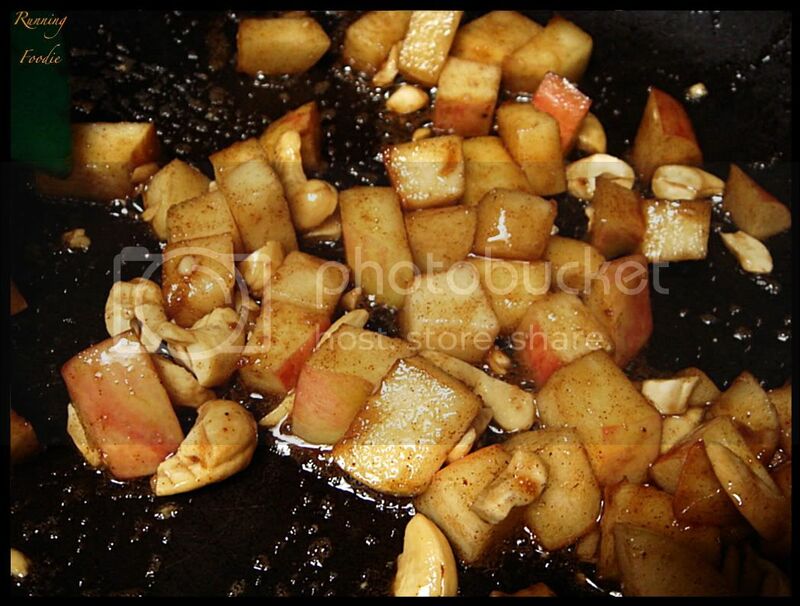 Cook, stirring frequently, until onion is softened, 3 to 5 minutes. Stir in rice, tomatoes, peppers, and 1¼ cup water; nestle chicken pieces in rice mixture. Bring to a boil; reduce heat. 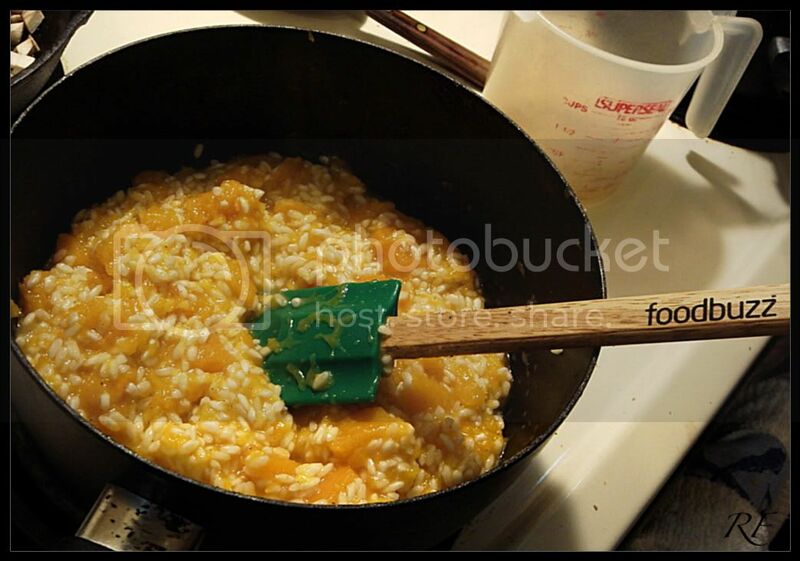 Cover, and simmer over medium-low heat until rice is tender, 55 to 60 minutes. If any liquid remains in skillet, remove lid and simmer until evaporated. Sprinkle peas over contents of skillet; cover, and remove from heat. Set aside until peas are heated through, about 10 minutes. Serve with lemon wedges, if desired. My brother was making oatmeal a while ago, and instead of the traditional toppings he made a caramelized apple topping that wasn't too heavy, sweet, or overly spiced. Slice, or dice, half of a large apple (it's not necessary to peel) and toss it with about 1-2 tablespoons brown sugar, a few shakes of cinnamon or other spice, and a squeeze of lemon. Heat half a tablespoon of butter or butter spread into a skillet on medium heat until started to foam/bubble, then add apple mixture, making sure to evenly spread the apples out. I added coarsely chopped cashews because since I like the taste of stir-fried cashews, it would be good here, too. Continue to cook, stirring occasionally, until tender when poked with a knife, but not falling apart, about 5-7 minutes (he didn't really time it, and neither do I, so that's a guesstimite). Keep the mixture bubbling. 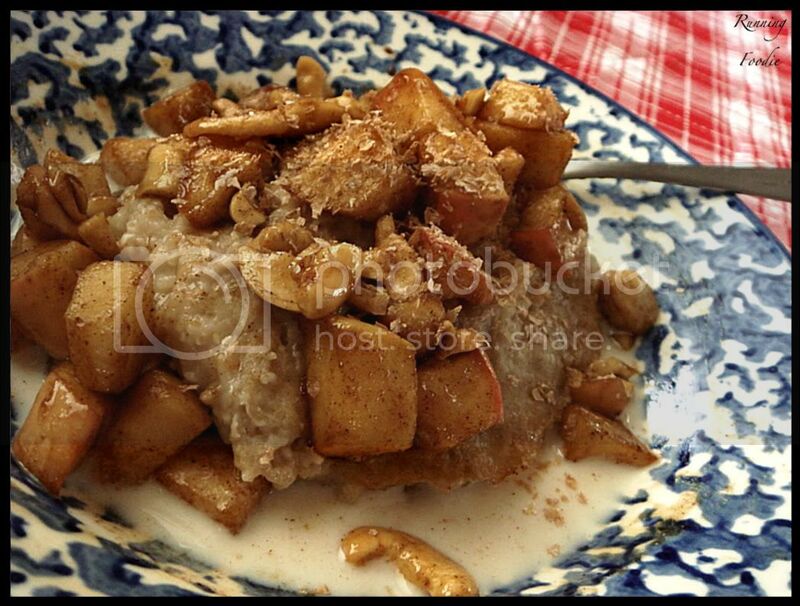 Serve over oatmeal with some milk and a sprinkling of wheat bran. Happy breakfast! 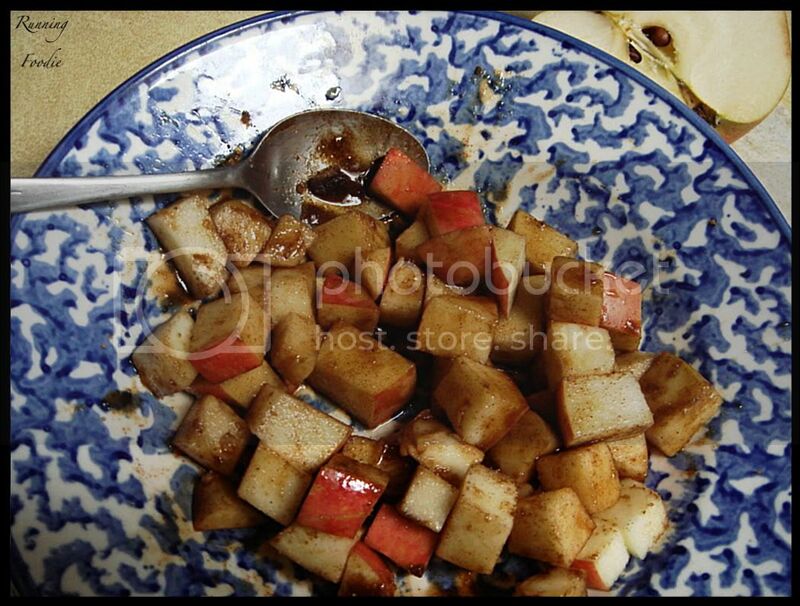 Toss together chopped apple with brown sugar, cinnamon, and lemon juice. Heat a skillet over medium heat for 1-2 minutes; when hot, add the butter. When butter melts and foam subsides, pour in the apple mixture and cashews in an even layer. Cook the apples until soft but not mushy, about 5-7 minutes. You should be able to easily pierce apples with a fork or knife. Serve hot over oatmeal. Foodbuzz has a Tastemaker program where you can opt in to receive samples and review them, this sampling being for Cowgirl Chocolates. 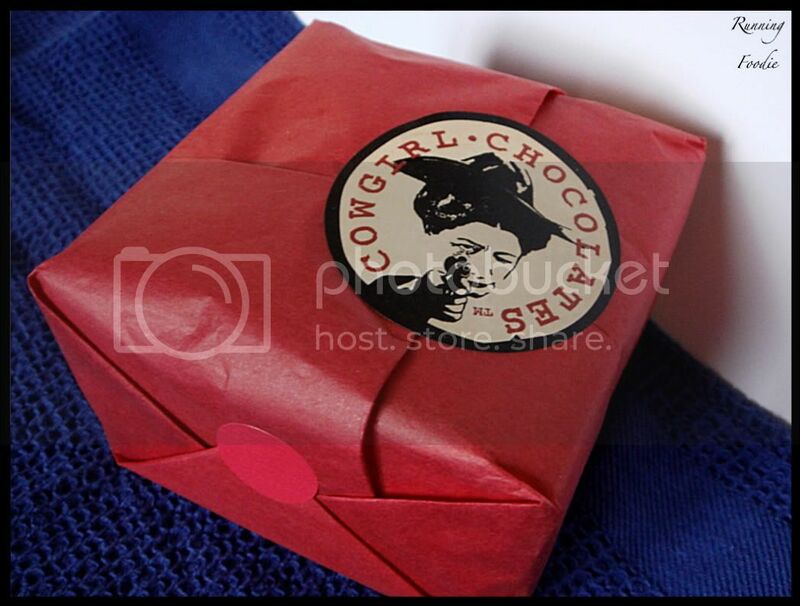 I got the package the day before my birthday, but I couldn't remember who sent it or why, and since it said 'Cowgirl Chocolates' on the mailing label I looked it up. Then I was reading emails and saw the Foodbuzz email and slapped myself upside the forehead and said, "OH, yeah!" What makes Cowgirl Chocolates unique is their sweet & spicy approach to gourmet chocolates, featuring cayenne and habanero pepper. The ingredient list shows just how good the flavorings they use are, some being hazelnut butter, different fruit oils, and natural flavorings. Nothing sketchy on there. Red ~ Raspberry Dark Chocolate: By far, one of my favorites. The raspberry flavor was really deep and it wasn't just a hint of flavor. At the end of the bite, a kick of heat hit the back of your throat. Of all the spicy truffles, this one had the most heat. Gold ~ Double Dark Chocolate: A nice, smooth dark chocolate with a bit of heat. The truffle filling was really smooth and melted well, just like all of the fillings, and a tiny heat sensation was at the end. 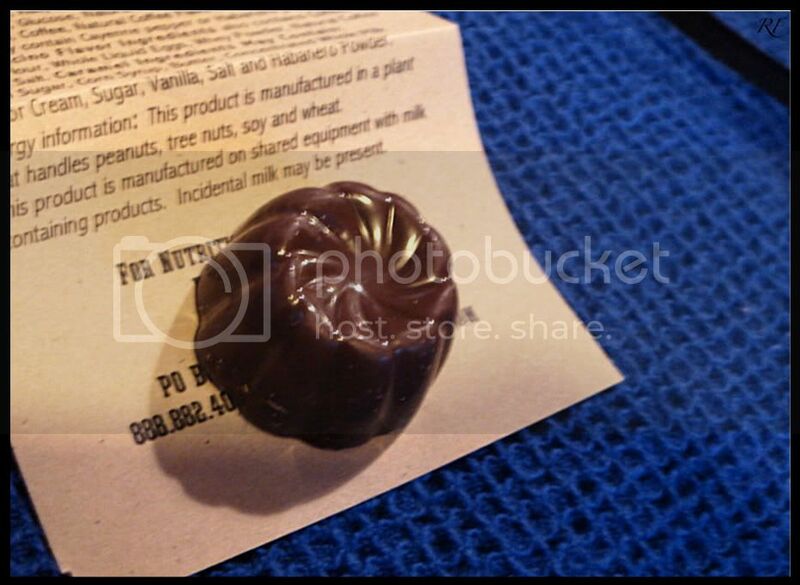 Dark Blue ~ Hazelnut Milk Chocolate: You cannot go wrong with a hazelnut truffle, and mixed with a good milk chocolate you are always in for a treat. There was a bit of spiciness, but we didn't taste much. Copper ~ Cappuccino: This was my most favorite because I love all things coffee. The coffee flavor wasn't overwhelming and the spiciness, second highest of the lot, was a nice compliment. 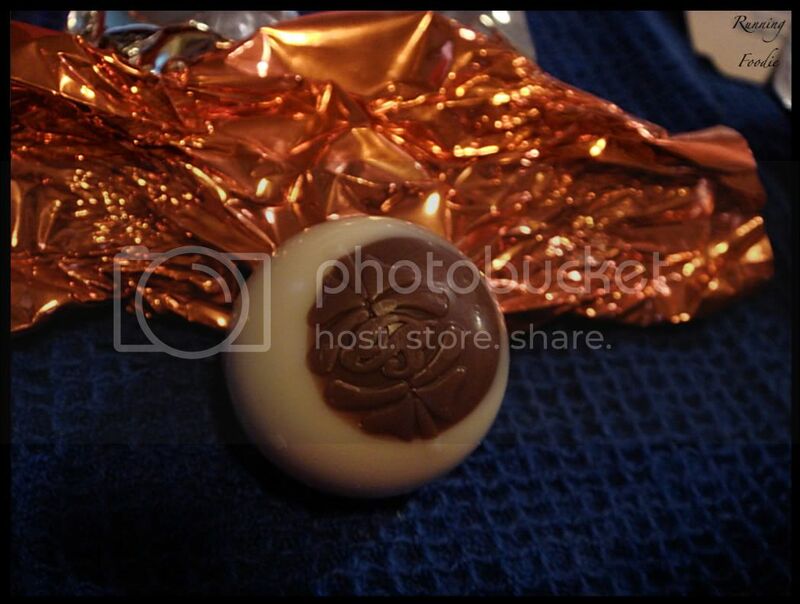 Brown Pillow ~ Habanero Dark Chocolate: A nice, smooth dark chocolate with a bit of heat. 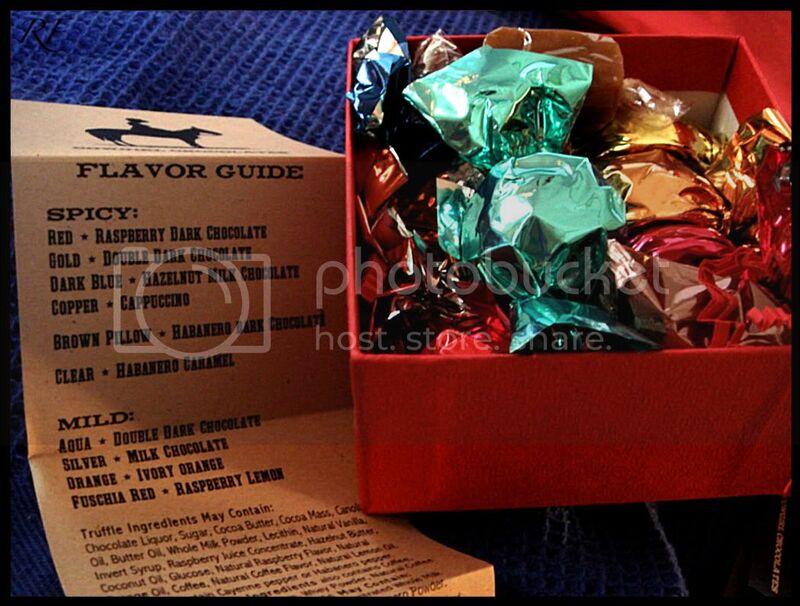 I couldn't detect any flavor undertones, but that didn't matter because the chocolate itself was good. Clear ~ Habanero Caramel: Slightly buttery, sticky, and the most spicy of them all, this was a really good caramel with nice flavoring, but not overly sweet. 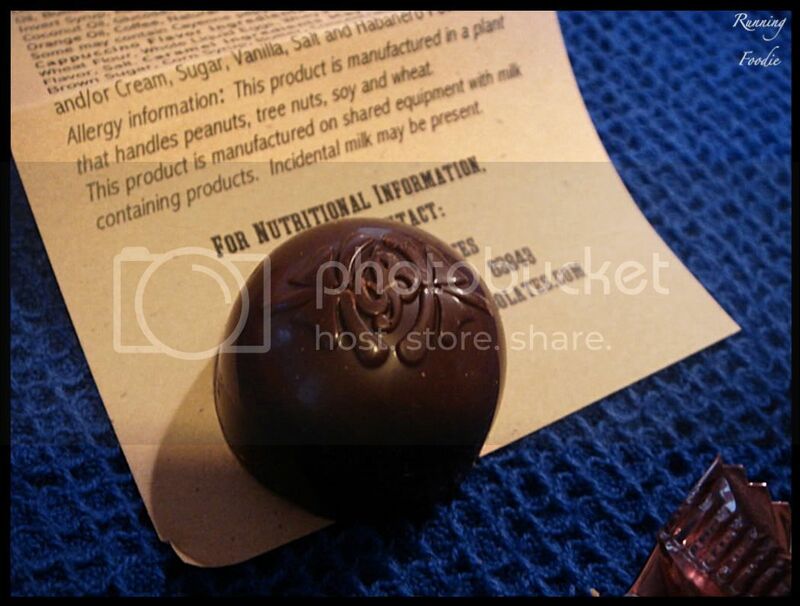 Aqua ~ Double Dark Chocolate: Basically like the Double Dark Chocolate truffle, but without any spiciness at all. Again, a smooth filling and a good dark chocolate flavor. Silver ~ Milk Chocolate: Like above, but milk chocolate. Orange ~ Ivory Orange: A small shell of white chocolate enveloping what tasted like an orange creamsicle filling. This was another favorite of ours because it wasn't a regular orange flavor as we were thinking. Fuschia Red ~ Raspberry Lemon: This was my mom's favorite because she hadn't seen a flavor like this in a truffle before. The filling wasn't ganache like, but rather just a fruit-like filling. A nice, light raspberry flavor with undertones of lemon. 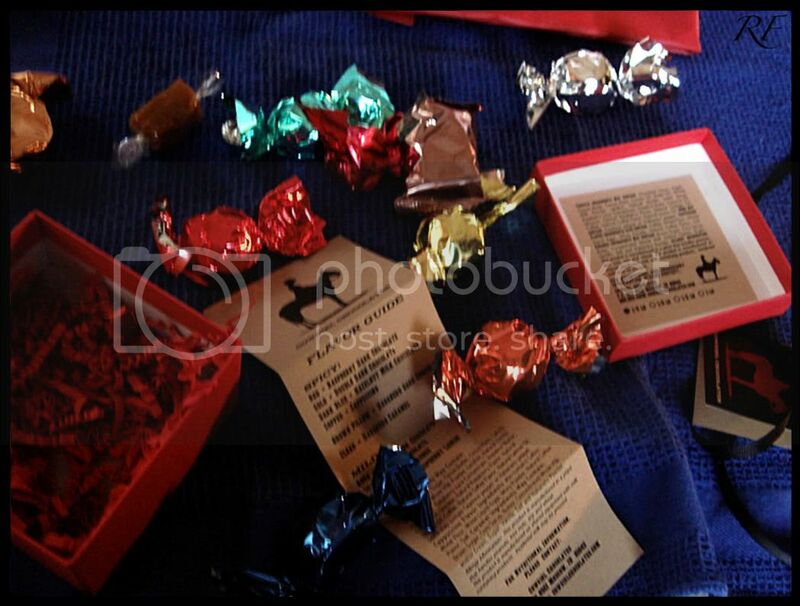 Overall, we thought the chocolates were very good, but the individual chili flavors weren't detectable, it was just the kick of heat that came at the end when you thought that it was over. My other thought was that the ratio of filling-to-shell could have been more, like the Lindt truffles. And really, I thought that Lindt truffles were just as good as these were, although I did enjoy eating them. Would I buy them on my own? Maybe. Their offerings for truffle flavors and different candy alone would warrant a second-go, and would also make a lovely gift because the chocolates come with reusable boxes, such as their 'keepsake boxes'. Cowgirl Chocolates don't just pay attention to the truffles, but also the packaging and presentations, which goes a long way in my book. 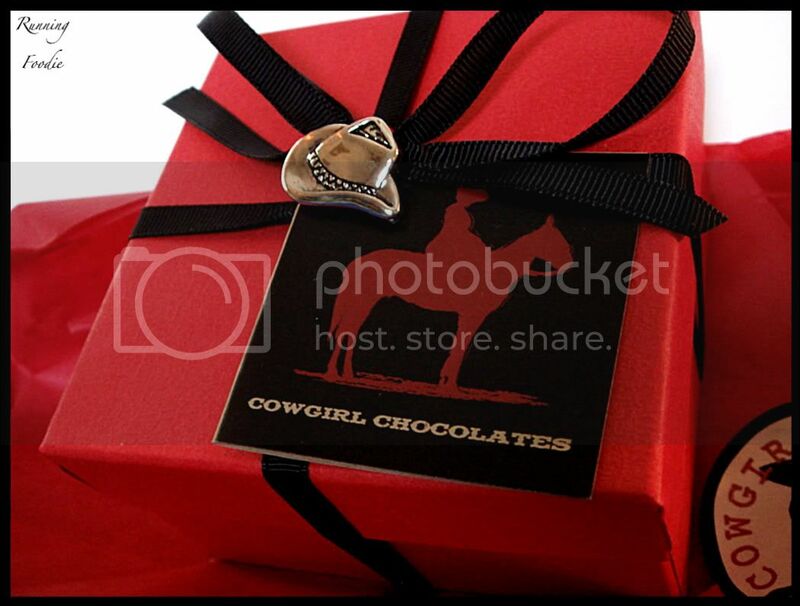 Thanks again to Foodbuzz for giving us the opportunity to sample Cowgirl Chocolates! It's that time of the year again when my brother and I celebrate our birthday. Three years apart, same day, what does that mean? Two times the food! 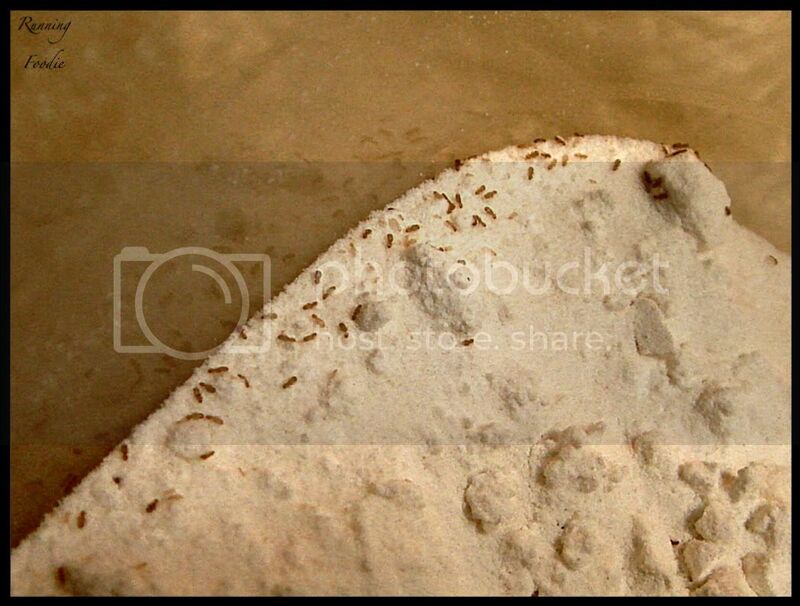 So I went to open the container of pastry flour, and much to my dismay I saw millions of little bugs. Obviously, I haven't been baking much with pastry flour. 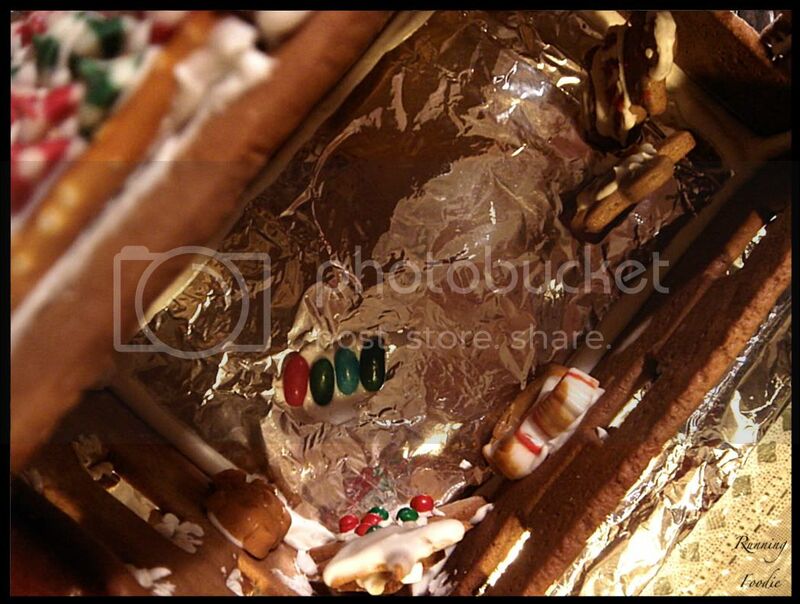 The only way to salvage the situation was to scoop off the top layer, bugs included, and use the flour underneath. KIDDING. It was all tossed. On the menu was a peanut butter-banana cake with chocolate frosting for my brother, and I wanted to create the cake from the previously mentioned (many times) Pooh book. The layers were pink and the frosting was chocolate, and I found a recipe for a real strawberry layer cake with a strawberry purée, no white cake mix, and a minimum of strawberry gelatin on Cookie Madness. The recipe for strawberry layer cake came from Domino Sugar. So pretty! I'm not really one for wearing much pink, but there's no doubt that pink really makes you happy. 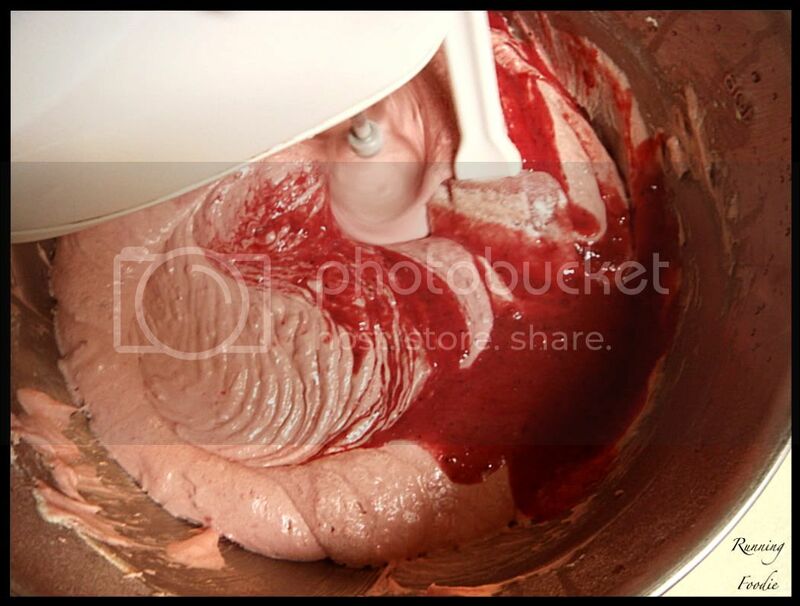 Never before have I actually smiled as I watched cake batter come together, but the pink swirls looked pretty! The only change I made to the recipe was decreasing the sugar from 3 cups to 2 cups. I thought about decreasing it to 1 3/4 cups, and it most likely would have worked because the strawberry puree was sweetened, but I wondered if it wouldn't make the strawberry flavor as pronounced. 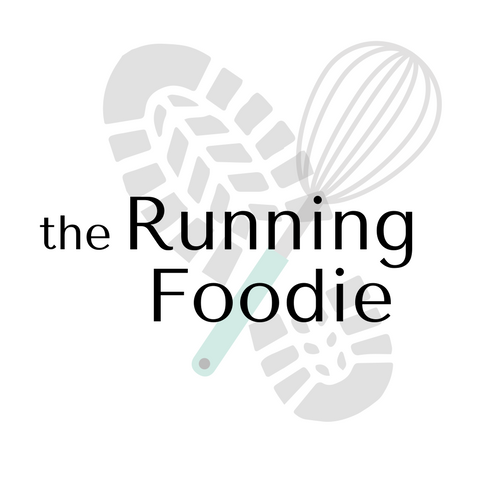 Thanks to the Daring Bakers and their comments on past challenges, they've successfully decreased the sugar in recipes without it negatively affecting the outcome, and remembering that I was able to do the same. What I also thought was interesting was that the recipe called for both butter and oil, and I don't know why that is. If I'm thinking correctly, I remember reading something about oil was used in recipes where a density was wanted, as in carrot cakes, but this cake wasn't meant to be dense (and it wasn't) so I don't get it. Enlighten me if you know, please! 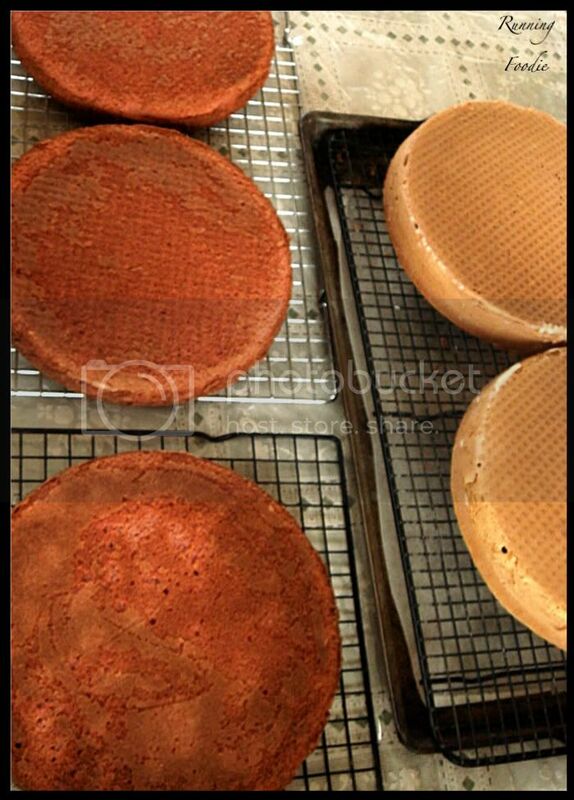 Here's all five of the cake rounds for both of the cakes. For my cake, I layered and frosted the outside with a regular chocolate buttercream made with melted semisweet chocolate, but it wasn't as dark as I would have liked. 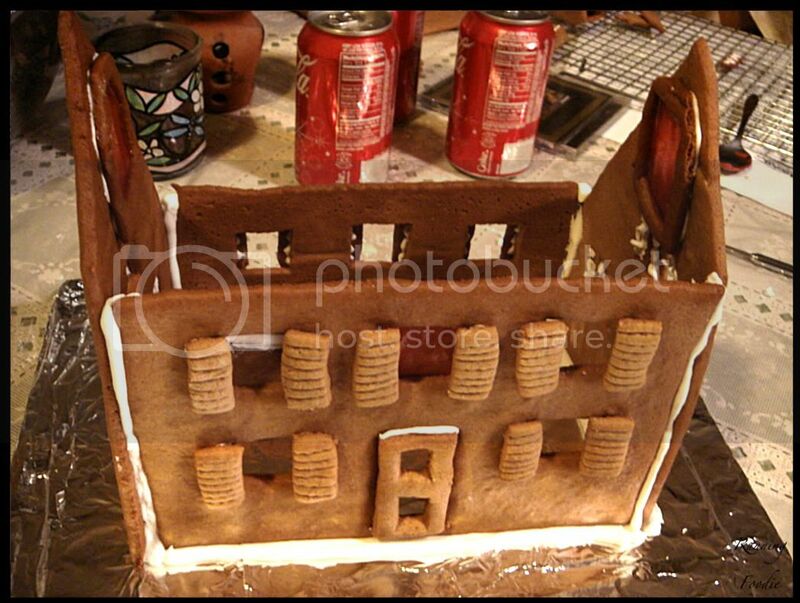 Probably an addition of cocoa powder might have helped. 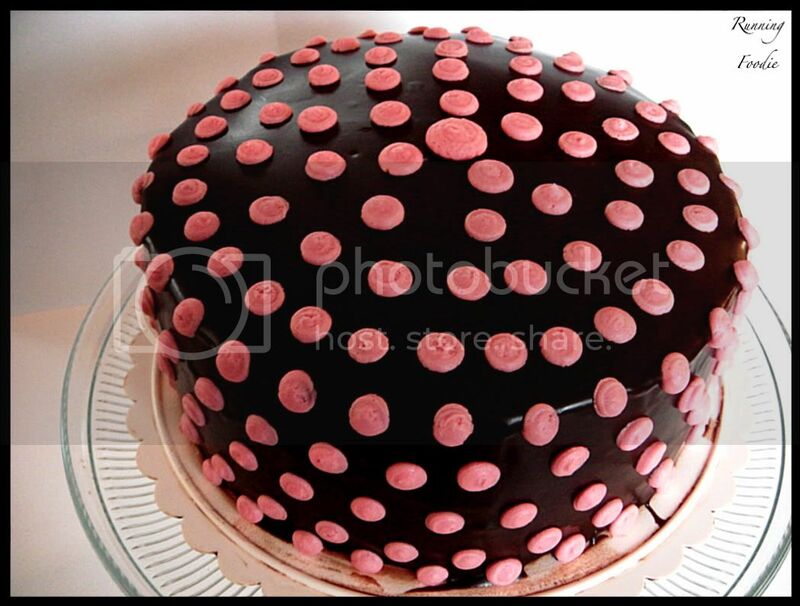 After that set, I poured ganache over the top to give it a really smooth, dark contrast from the pink dots I piped the next day. 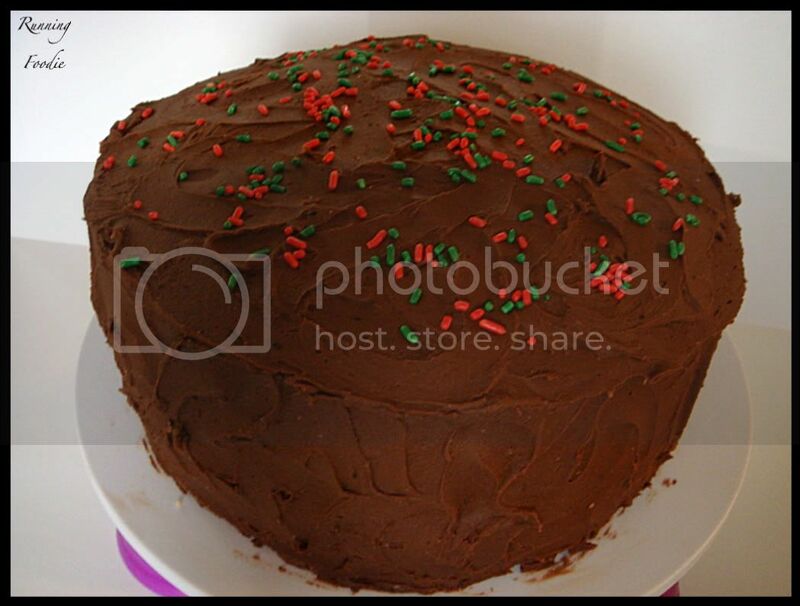 Yes, I made my own cake; I considered it a gift to myself and, most importantly, I wanted to make it. I know I'm not the only one who's like that. My mom made a peanut butter-banana frosting/filling for the layer and a bit on the outside, and a chocolate fudge frosting was used for the outside. I've realized that for many of the past cakes I've made, I've forgotten to slip strips of wax paper underneath the layers so that when I finish frosting, I pull the strips out and the cake stand remains clean. When my mom was at the store a few days ago, she saw a container of arborio rice that was discounted and asked me if she wanted risotto for my portion of the dinner. 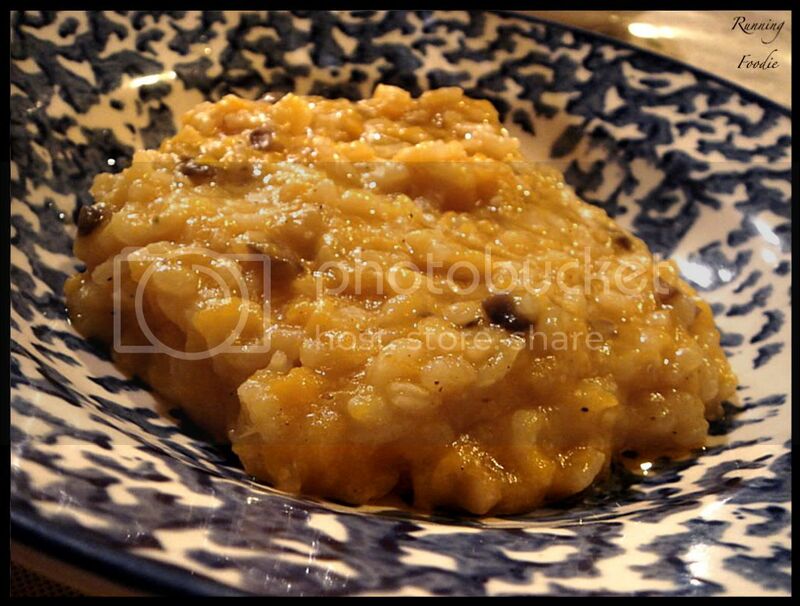 She had blanched chunks of butternut squash and put them in the freezer and I remembered a recipe for butternut squash risotto from Everyday Food that I made a long time ago, and that became my dinner. 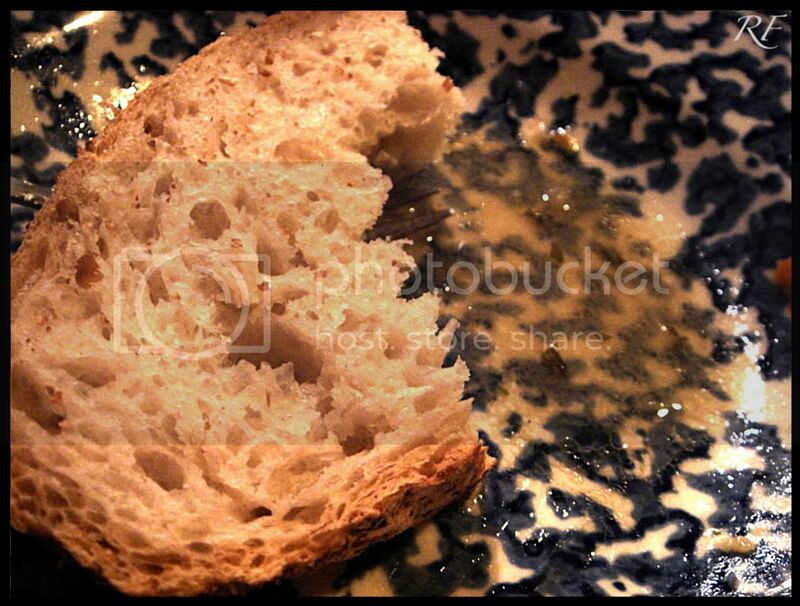 No-knead bread dipped in miso vinaigrette. Both were amazing, and the miso vinaigrette is my new favorite, which I'll blog about later this week. 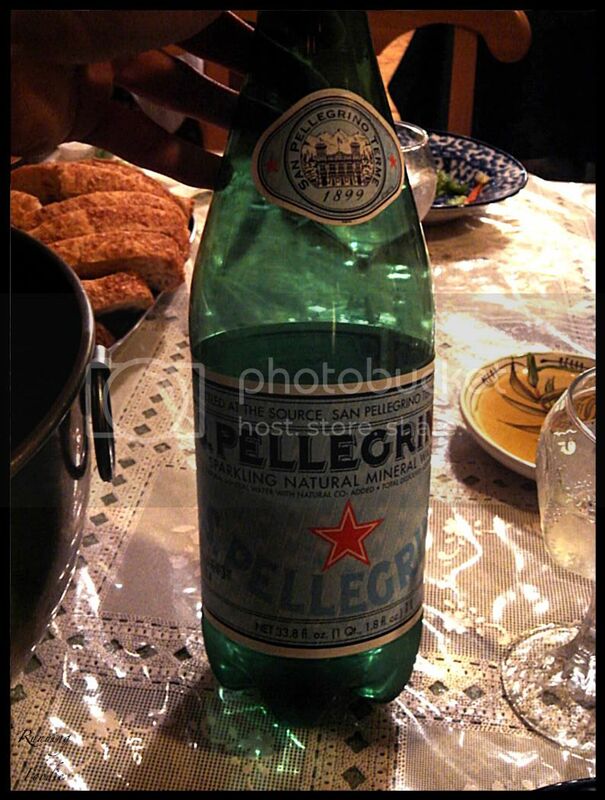 I'm very sad that Pellegrino no longer uses glass bottles. As odd as this may sound, that was one of the reasons I liked buying it. The risotto. A slight sweetness from the butternut squash mixed well with the small amount of parmesan cheese, and the subtle hint of lemon zest, while not really noticeable itself, made the finished dish seem lighter. 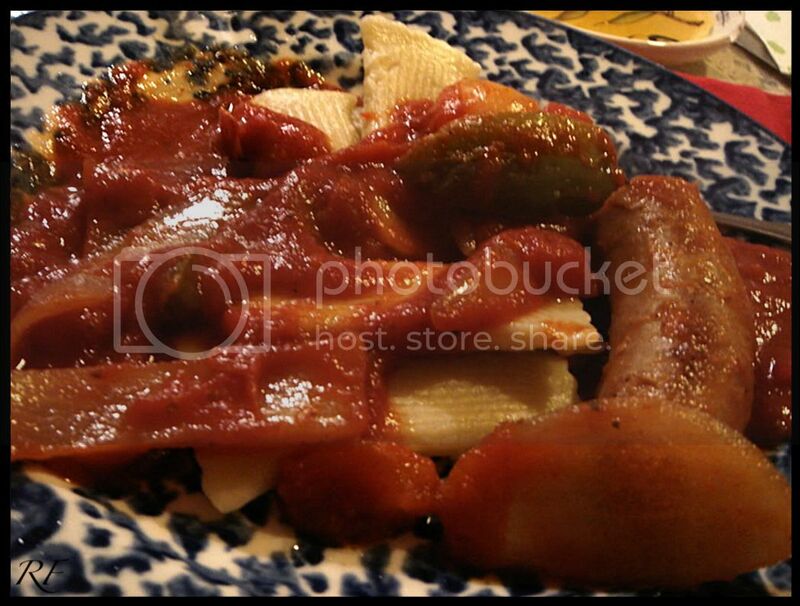 The rice was firm, yet tender, and the contrast of the 'sauce' and the rise blended together wonderfully. Risotto is amazing stuff. 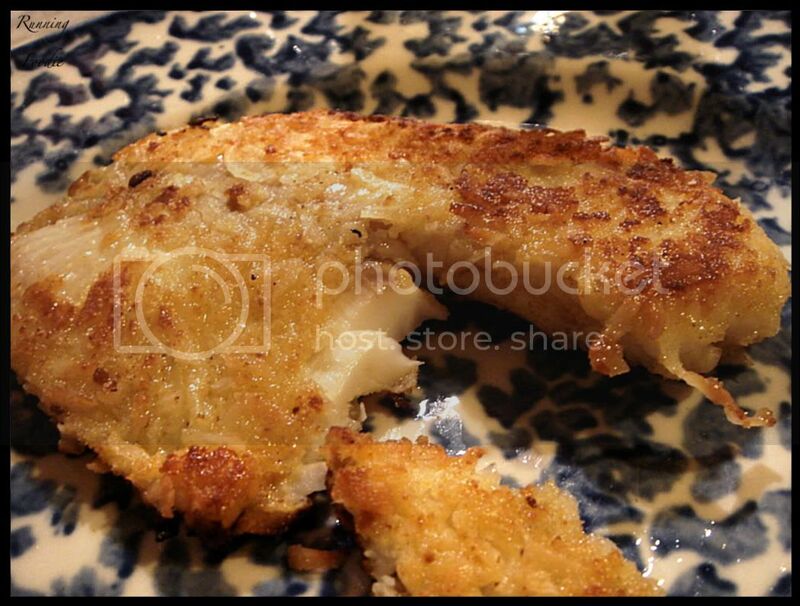 For the next course we had coconut-crusted tilapia. It was good, but the sweetness from the coconut was kind of different (my mom and I think it needed unsweetened coconut), and it probably needed a spice or herb to 'temper' it. All I added was white pepper (mom added the kosher salt) to the coconut-bread crumb mixture before Mom coated the pieces. Tilapia is a great fish to cook with because it's firm, holds its shape, and the flavor of the fish itself won't clash with the flavorings you use. We use it often in our family in soups, like above, and things of that nature. My brother requested pasta, so my dad made a peppers and sausage sauce and it was served with portobello-cheese stuffed ravioli-like pasta. This was quite a bit of food and I was pretty stuffed. But not stuffed enough that I couldn't eat two slices of cake! 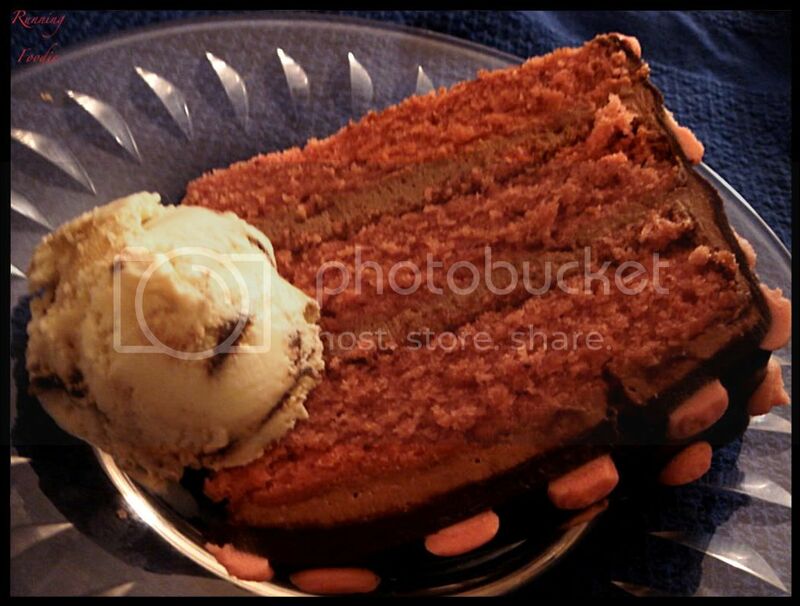 My brother's cake, with chocolate-cherry ganache ice cream. 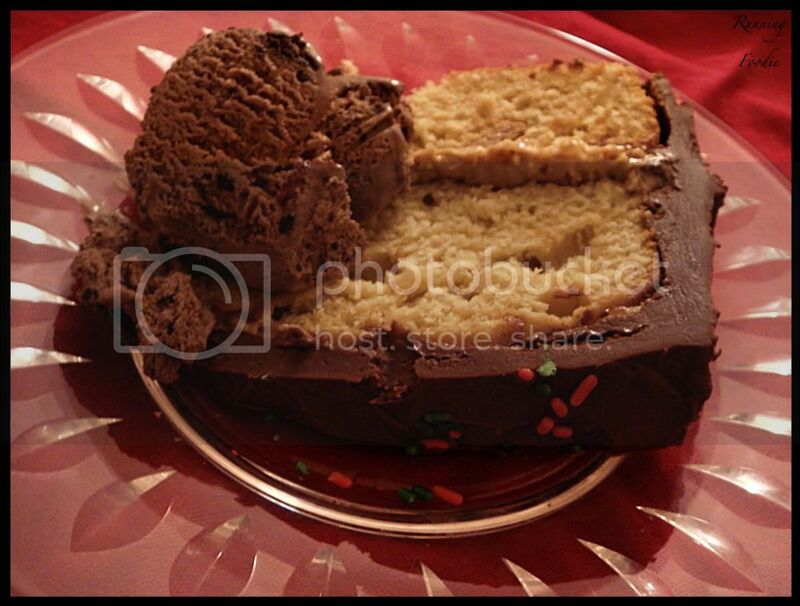 My cake, with cafe latte ice cream (it wasn't as good as the chocolate ganache ice cream). That's what we had for our birthday. And guess what? There's LOTS OF CAKE LEFT! 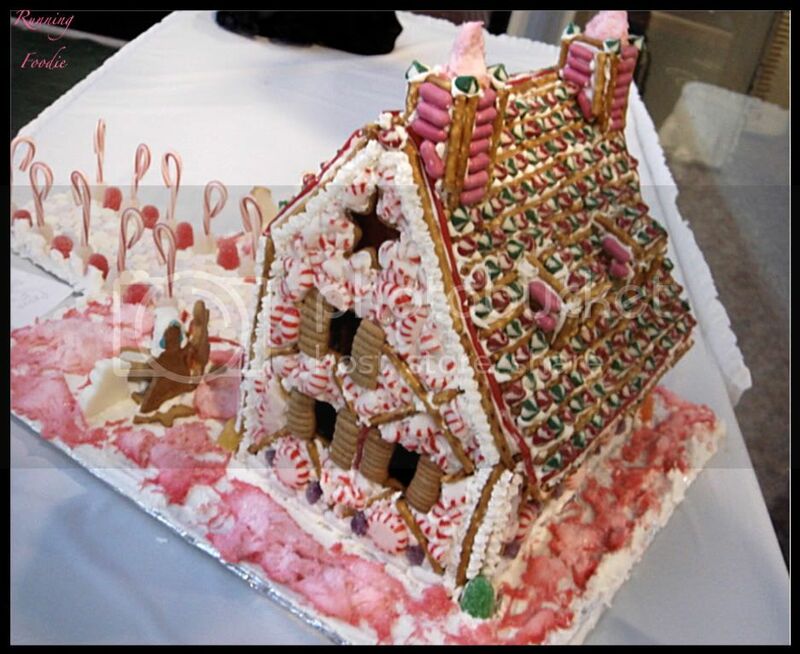 Christmas comes but once a year, for which I am very thankful because that's the only time I want to build a gingerbread house. Whew, okay. I feel better now. I'm just going to take you all on a "walk-through", pointing out the details as I go along. See above? That's the house. 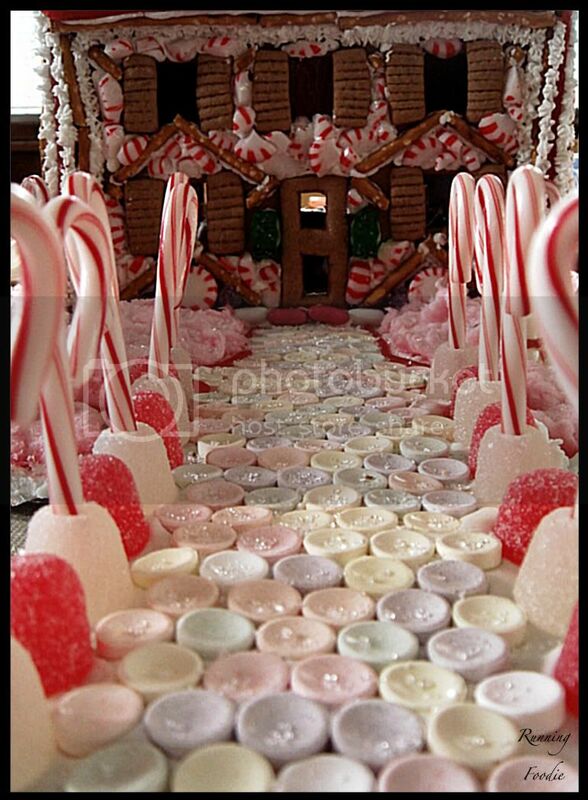 My mom wanted a walkway, and my brother put it together lined with mini candy canes. Both the aforementioned brother and my mom worked on the little chocolates that went in various places outside and inside the house. They did a great job, paying close attention to detail. On the other side are more chocolates, a North Pole sign and two reindeers. 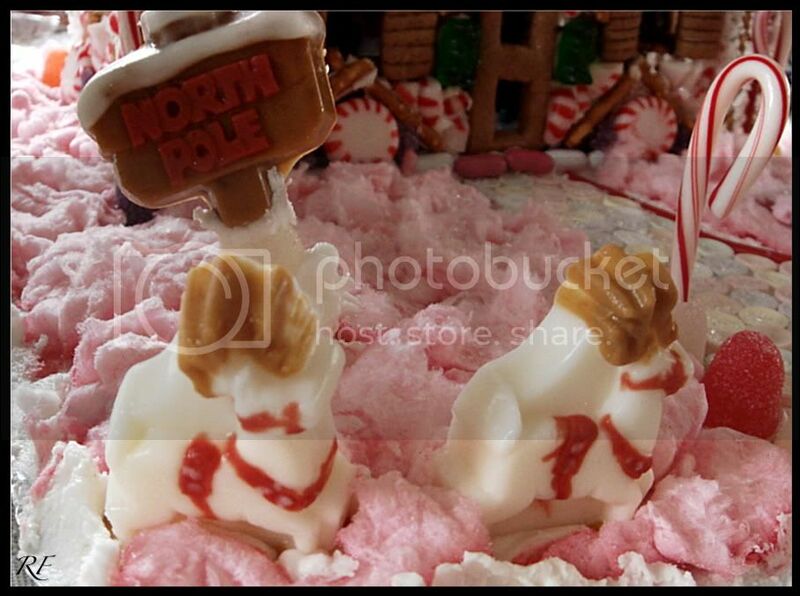 And finally, a candy mold rocking horse. 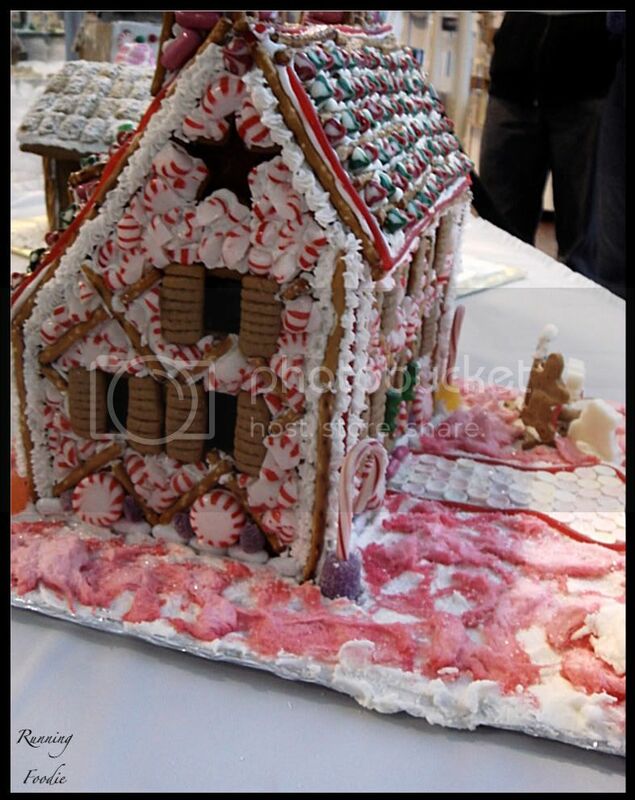 It was my mom's idea to completely cover the outside with crushed peppermint pieces (picture the three of us throwing the round peppermint circles down on the ceramic floor... it was much needed therapy), and my other brother made the criss-cross lines with pretzel sticks. The star window has a 'stained-glass' backing, my mom's idea. Here's a picture of the back, which unfortunately looks rather flat. But those windows were my one of my brother's idea (read: not from the pattern), and it really added quite a bit to the finished look. 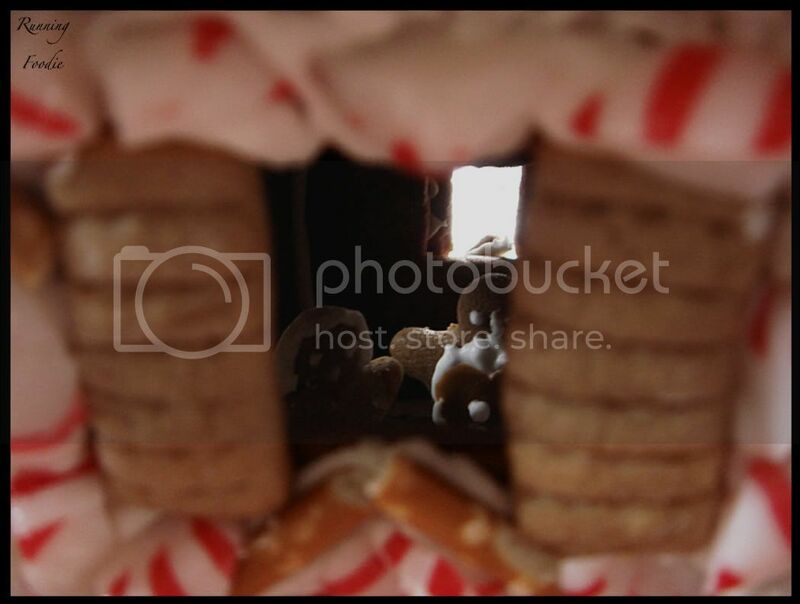 Look at the little gummy bears in the windows! And that, finally, ends the tour of our little house. 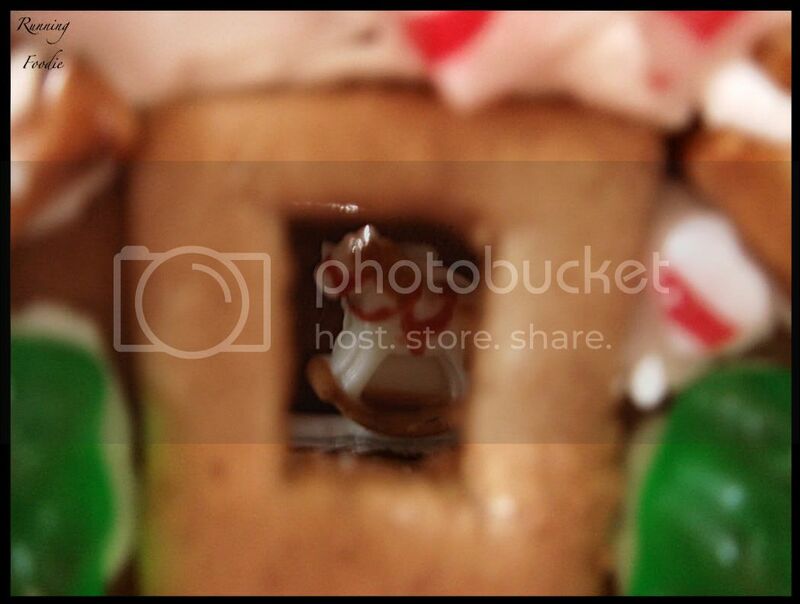 I took pictures of all the other gingerbread houses that I may upload and stuff later. Anyway, I hope you enjoyed! 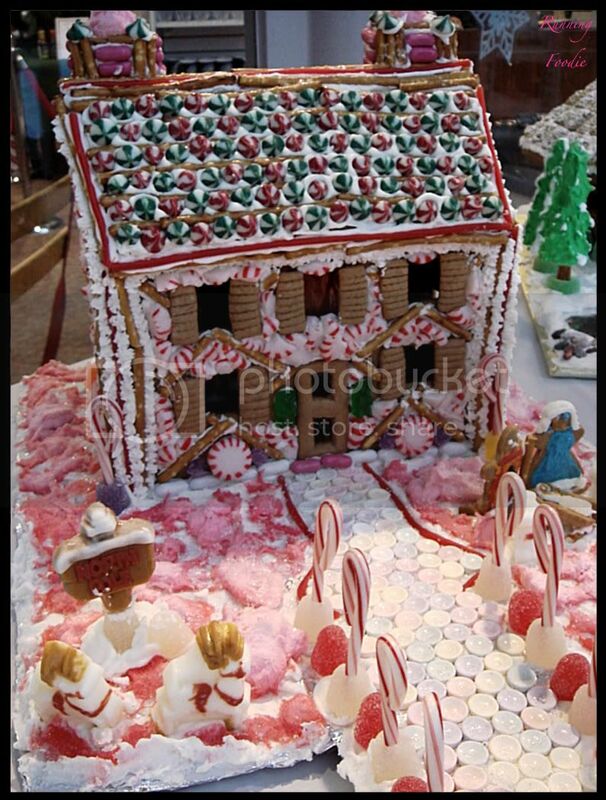 So my mom thought that our family should build a gingerbread house for a contest South Bend was holding. Initially, I was very hesitant because I rarely do things "just because" and I'm a bit of a perfectionist. So I hemmed and hawed, sulked and frowned, and I'm sure I did other things that I wasn't purposely doing; it was just my natural state of being under the circumstances. But the day came to finally build it, and I found a pattern by Bob Villa. What better template to use than one by him? What stood out to me about the particular pattern I pushed was that the shape wasn't the standard house that I figured mostly everyone would be using. The process began with my dad and brother, who cut out the template. If ever there was a circumstance, however minor, to swear up a storm, this was it, but I contained myself because that's not how I am. The dough, although it had 6 cups of flour, was on the soft side, and although I rolled it out just-from-the-fridge, it quickly warmed up and the pieces became contorted upon transferring to a baking sheet. Quickly coming up with a way I could save my sanity, I rolled the dough out on a sheet of wax paper and, using the paper as support, turned out the entire rolled out sheet onto a parchment-lined baking sheet, then my brother cut the pieces. 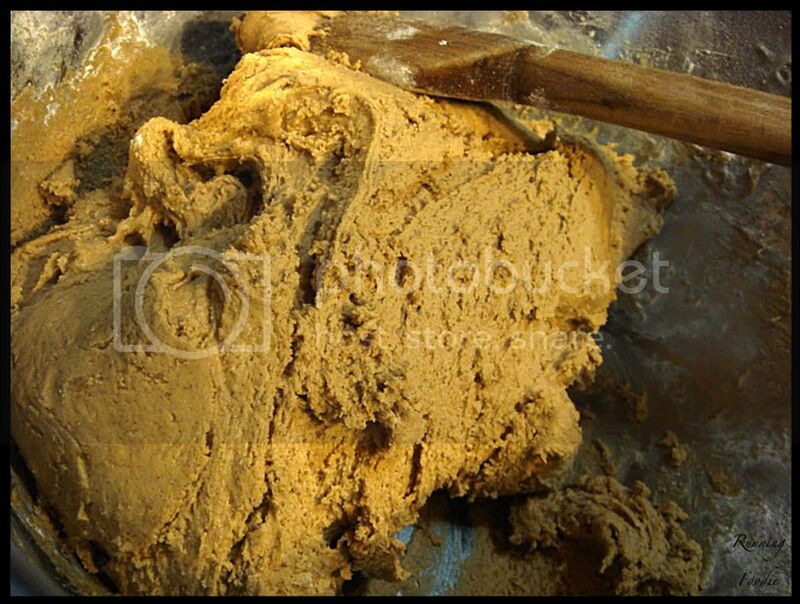 All we had to do was peel away the unused dough. That's why, if you noticed, there are three side pieces (the ones with the stars on top). 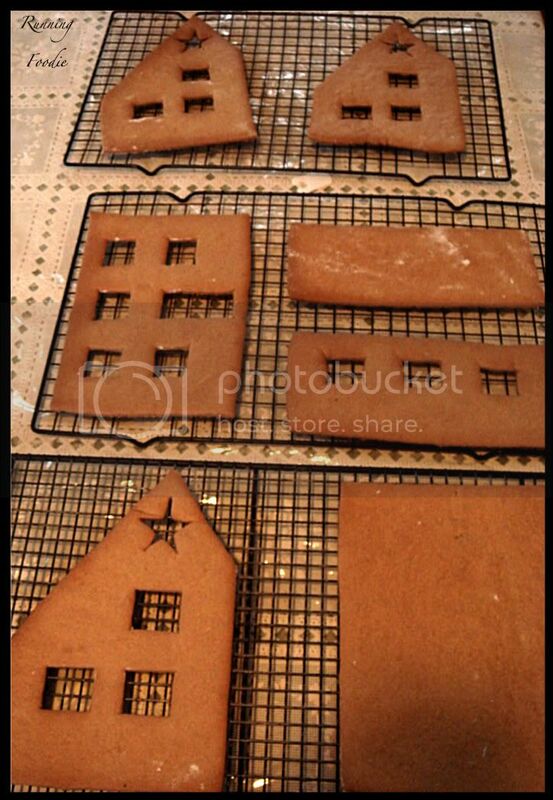 Before constructing, of course, the pieces have to be at room temperature. 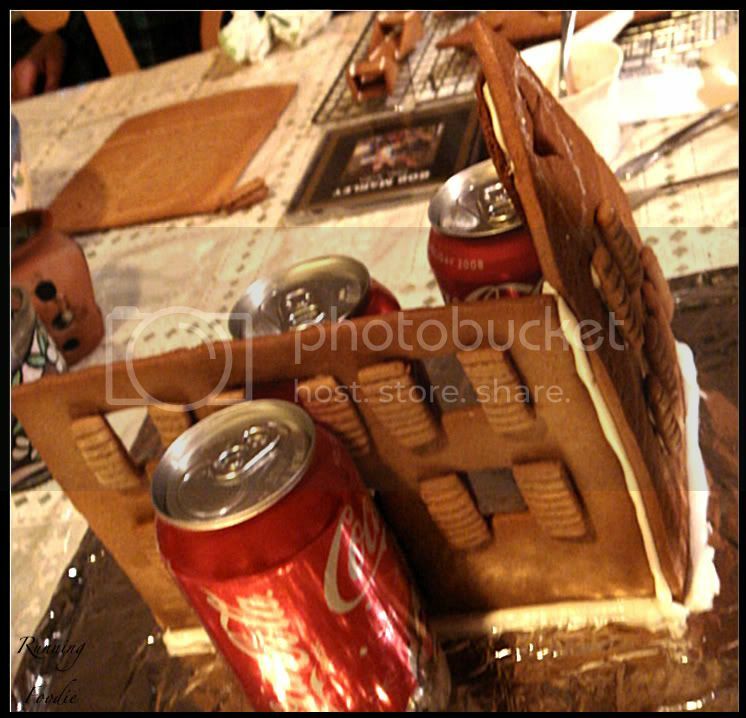 That happened quickly, so Mom made a thick royal icing and the construction began, using cans of Coca-Cola as supports. 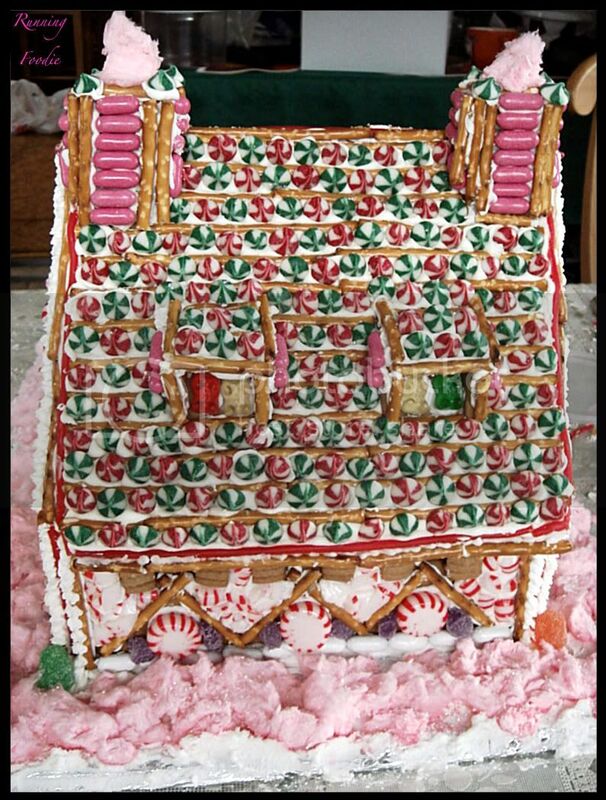 My brother came up with the idea of making shutters for the windows (all 14 of them) and a frame for the door, and my mom thought to use a star cookie cutter for the top windows on the sides, and make the stars and the top window above the door stained-glass. My dad pointed out that we added some of the decorations to the wrong side of one of the side panels, but the icing hadn't completely set yet and it wasn't that much of a problem, except that we didn't catch it. For the roof I originally wanted to make wafer cookies, white with browned edged, for the roof shingles, but the day was ended and the kitchen was progressing rapidly into disaster zone status, so I used the swirled white chocolate chips my mom bought and stick pretzels. 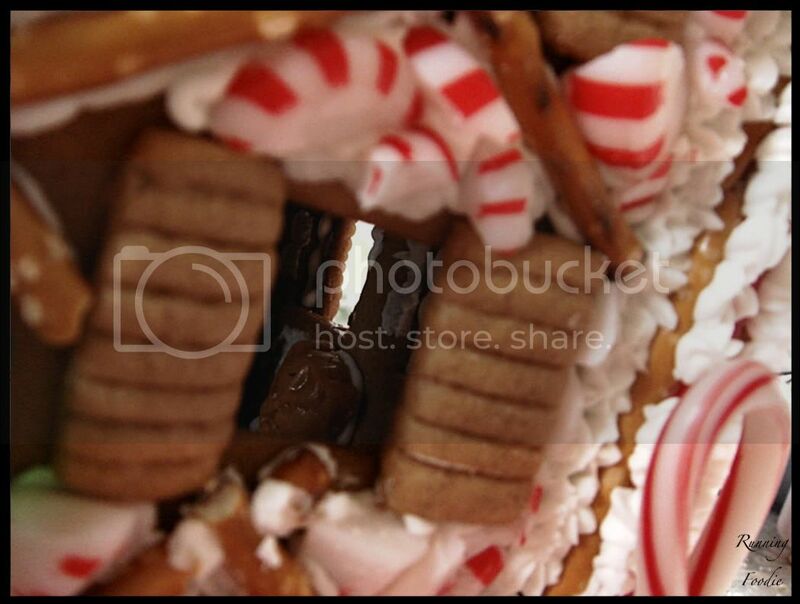 My mom and Brother 2 made candy molds for the inside with a gingerbread tree and two people. 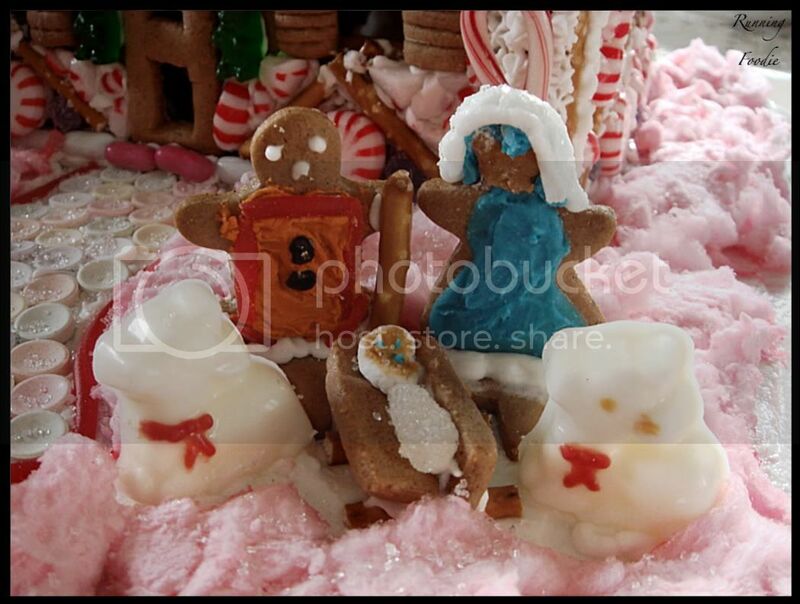 They did an amazing job on the candies (pictures later). Brother 1 was attaching the two roofs. 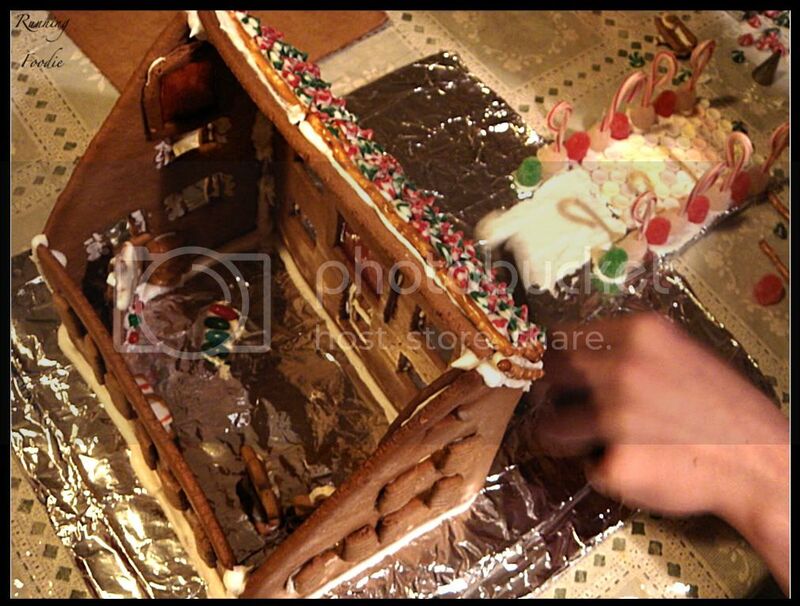 And Brother 1 decided two make two windows that attached to the back roof. Genius. A little touch that really added to the effect. O.M.Gooses. 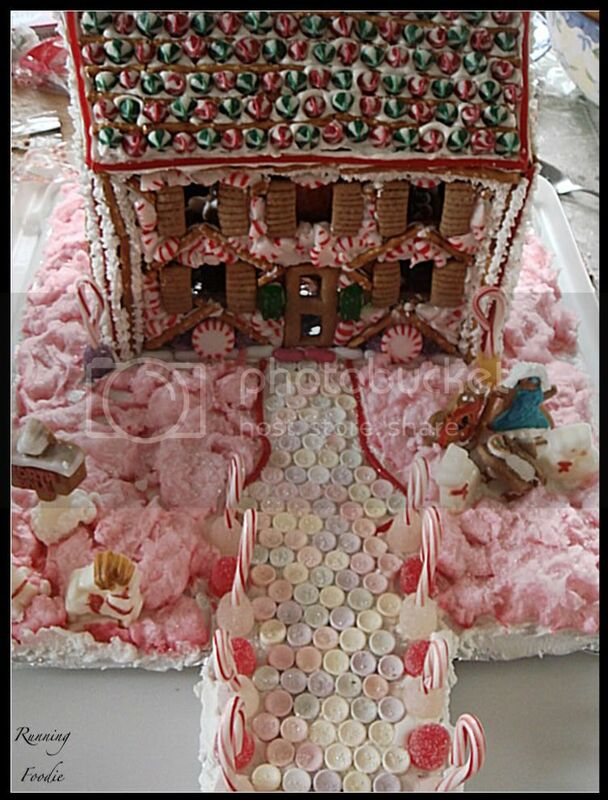 Just thinking about that house made me tired all over again. 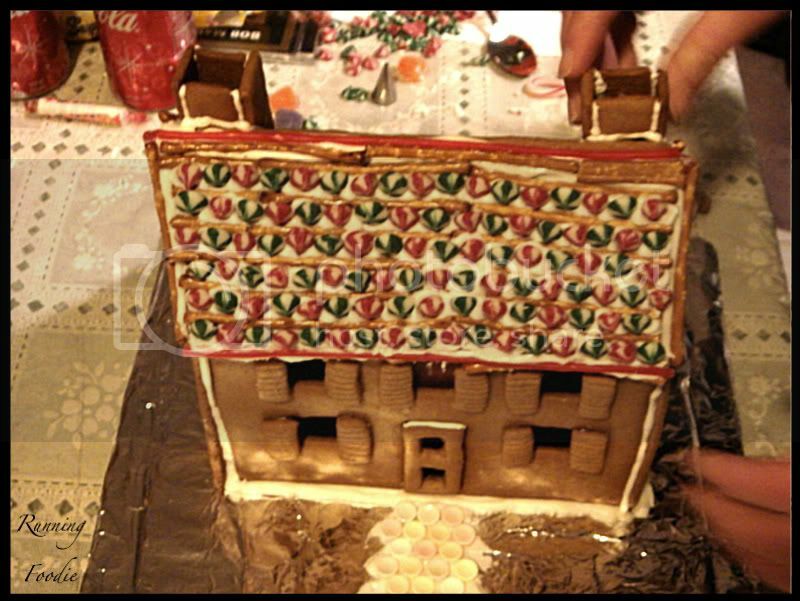 After my brothers and I finished the roof (read: REALLY late), we were starting to get obnoxious and loud and the icing was running out, so I said "NO MORE!" and went to bed. 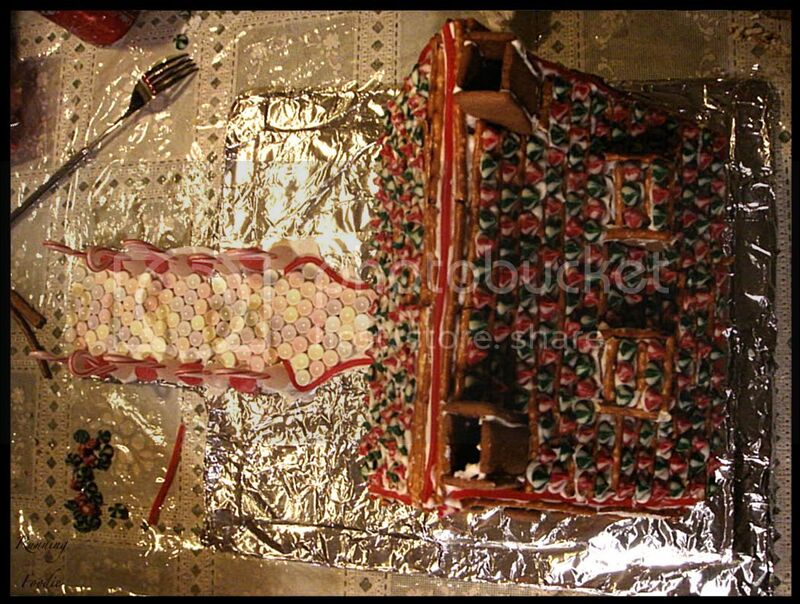 Next morning, I woke up to a gingerbread house even more amazing than what I left, which I will show you on the next post. There really isn't a better title than that. 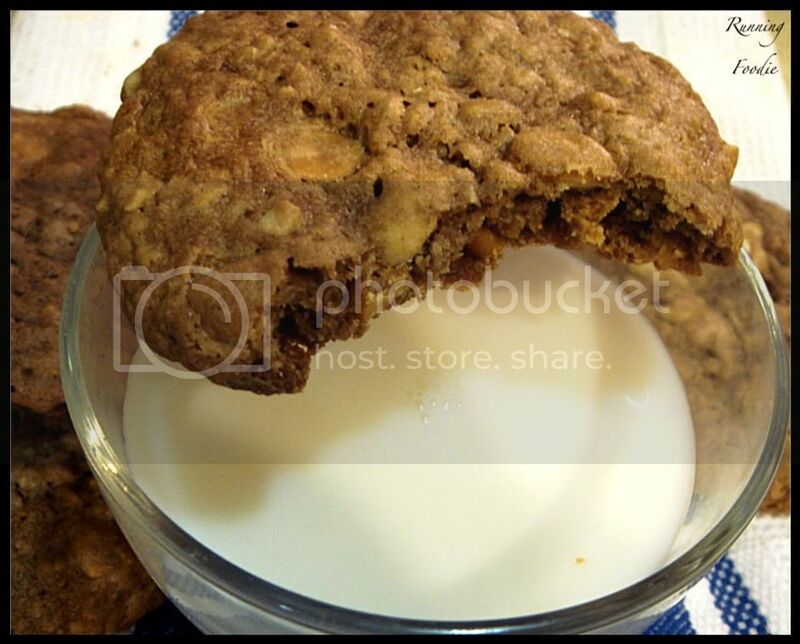 Over at Em's blog, Sugar Plum, she has a recipe for Cashew-Butterscotch Cookies. 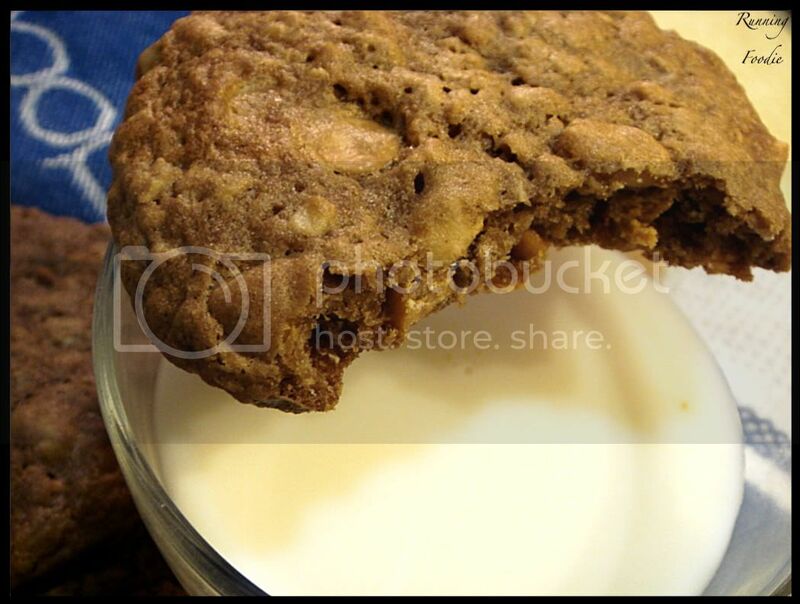 I've been wanting to make oatmeal-butterscotch cookies, and since this recipe has oatmeal I figured I'd go with this one. 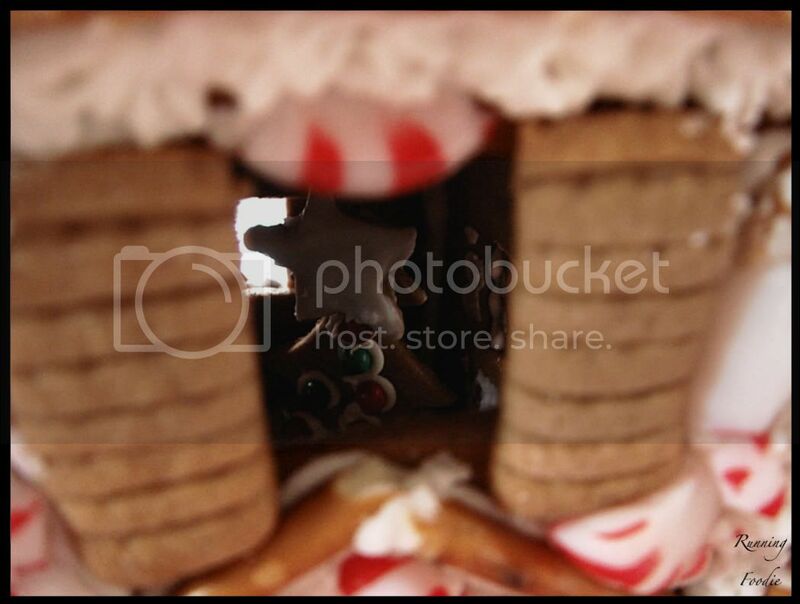 And what could be better than cashews in a cookie? I changed this particular recipe to make it more like Em's other cookie recipes by browning half the butter and cutting the other half into the dry ingredients. Also, I added an extra egg and a little orange glaze I had leftover from another day. The verdict: Winner! Everyone loved the deep butterscotch flavor, not only from the chips but from the brown sugar, and the brown butter gave it such a unique flavor. Texture-wise, these cookies were thick, chewy and not cakey, and crispy on the edges. Cashews should be used in cookies more often, as the taste of cashews is rather buttery and therefore tastes great with sweet ingredients. I'll probably toast the cashews the next time I make this recipe. To sum it up, these are perfect cookies. Speaking of which, there's still some dough left in the fridge, so I'm off to bake up another dozen. Thanks for the recipe, Em! The typical morning beverage for me is coffee, but there are times when I want something that leaves me feeling refreshed afterwards while still satisfying any desire for caffeine. To veer somewhat off-topic for a moment, Sam asked about my recipe for spiced cider. I don't really follow a recipe, but here's what I use for about 8 cups of apple cider or juice (you can also use half apple juice, half cranberry juice). If you have a percolator, which is what my mom uses, pour the juice into the base, place the spices and fruit slices into the basket, set up the basket inside the base and pour the honey on top of the spice-fruit ingredients. Plug in and percolate away. For a pot, I place all the ingredients in the pot along with the juice and bring to a rapid simmer, then simmer until heated thoroughly (covered with a lid), about 25 minutes, but you could place the spice bundle in a cheesecloth and tie the ends if you prefer. Check to taste if it's to your liking. Very simple. Right, now what does grapefruit have to do with anything? My change-of-pace breakfast tea, which reminds me of spiced cider a bit. Honey Grapefruit Soother from The Little Big Book of Pooh is a lightly spiced green tea-grapefruit tea sweetened with honey. It's warm, it's refreshing and it's a nice change from coffee. Because simply put, I drink way too much coffee. I will digress once more to say that if I ever decided to try the 'grapefruit diet', I'd epically fail. 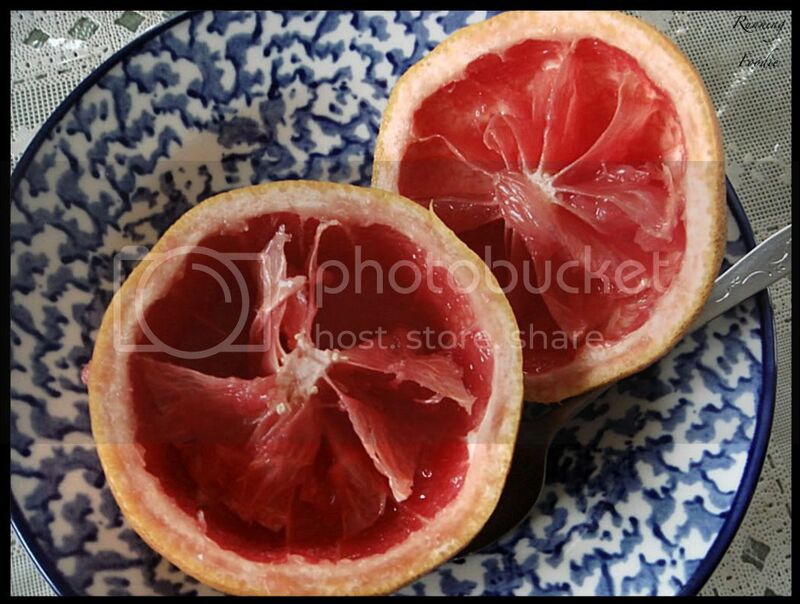 When I first found out that half a grapefruit is one serving, I envisioned myself slicing a grapefruit, wrapping the unused portion in plastic wrap to keep the fruit from drying out in the fridge and saving it until breakfast next morning. Or I could just eat both halves, which is what I decided that moment to do, after which I normally squeeze the juice out and drink it. 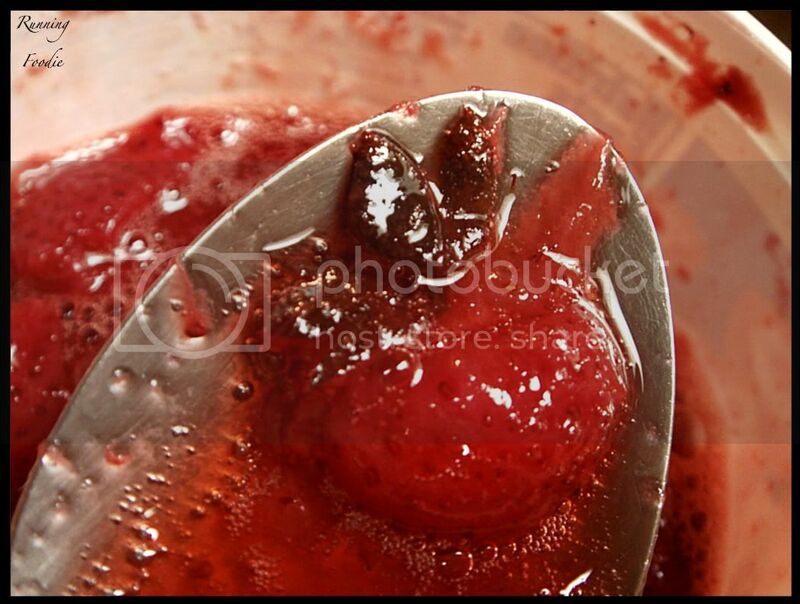 But the other day I squeezed it and measured out just under ⅓ cup juice, which is the amount needed for the tea. Make sure to take out any little seeds, or just use bottled grapefruit juice. 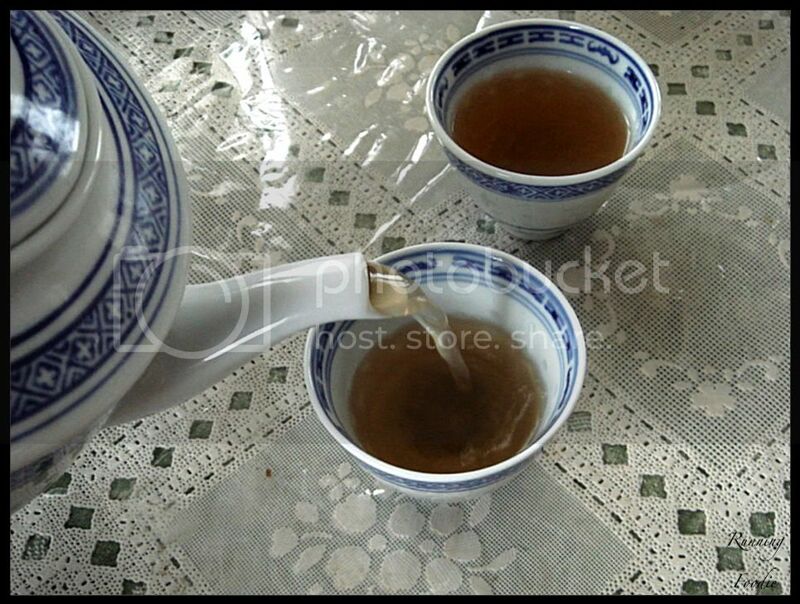 Place one green tea bag in a little teapot with one cinnamon stick and pour 1½ cups boiling water inside. Steep for five minutes. 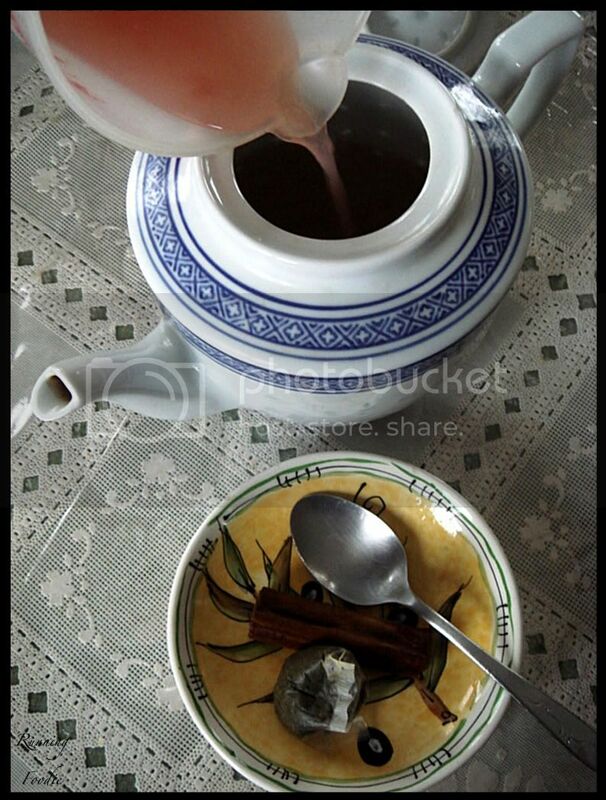 After steeping, remove the tea bag and cinnamon stick and pour in the grapefruit juice. Typically Pooh, stir in 1 tablespoon plus 1 teaspoon of honey. Use more or less depending on your preference. 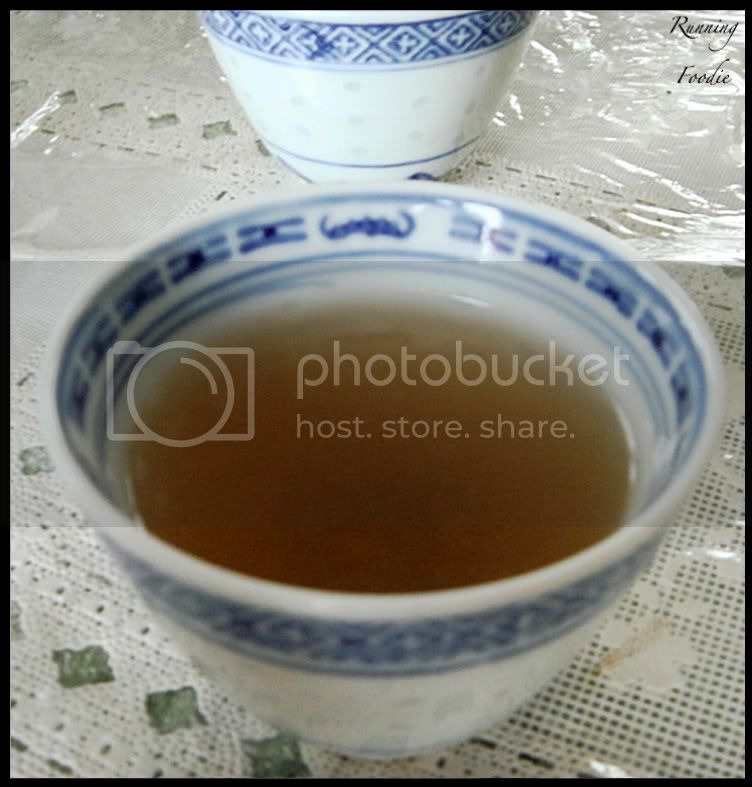 The resulting flavor is a lightly spiced green tea with citrusy flavors, not only a nice change from coffee but also from plain tea. Whatever your breakfast drink of choice is, there is nothing better on a cold morning than a steaming cup of a soothing drink. 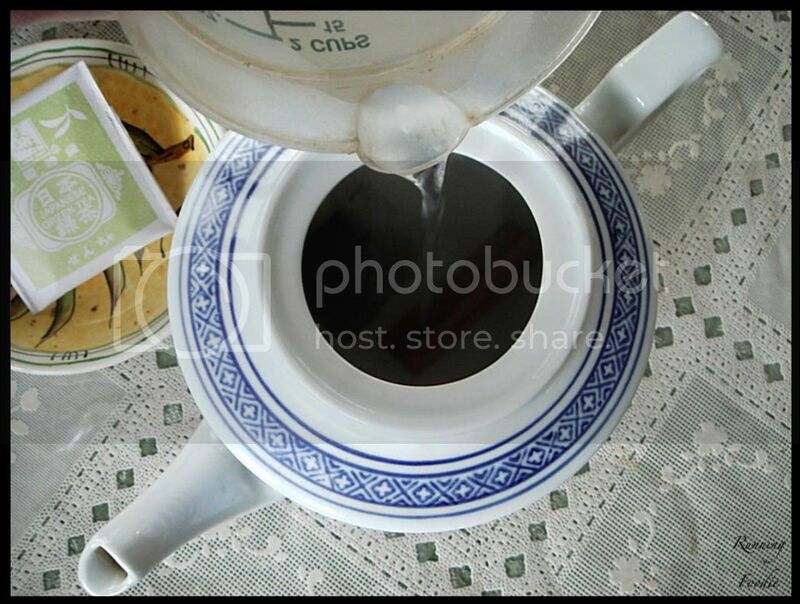 In medium-sized teapot, place tea bag and cinnamon stick. Add boiling water and steep for three to five minutes. Remove tea bag and cinnamon stick and add grapefruit juice. 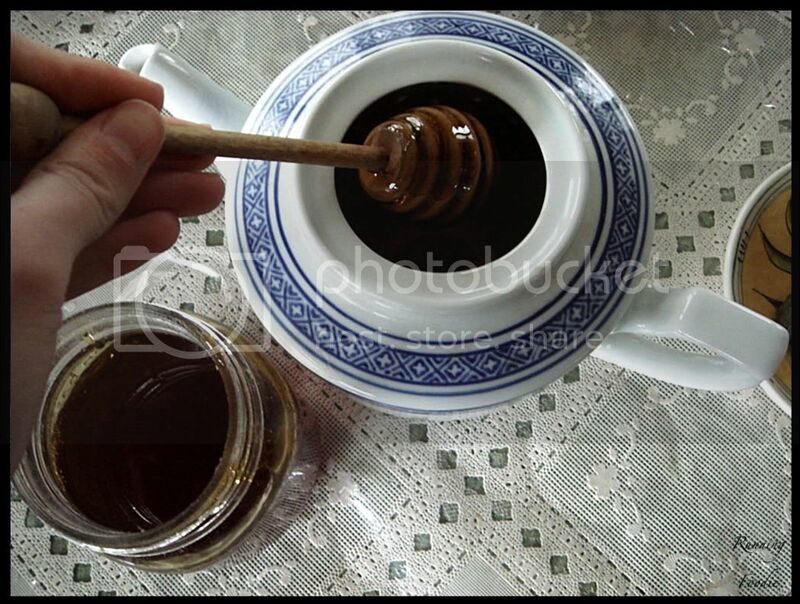 Stir in honey until it dissolves. Pour into your favorite mug and sip away.